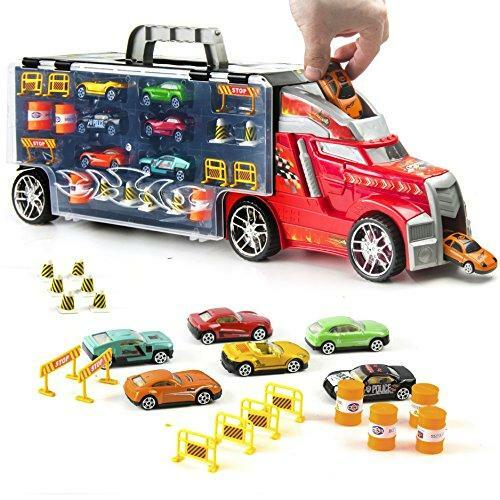 shoppingexpress.pk: Detachable Car Carrier Toy Truck with 6 Toy Cars and Accessories For Kids by Prextex - 21"
Toys & Games > Detachable Car Carrier Toy Truck with 6 Toy Cars and Accessories For Kids by Prextex - 21"
Detachable Car Carrier Toy Truck with 6 Toy Cars and Accessories For Kids by Prextex - 21"
The Car carrier truck with six car and accessories would be the best ultimate gift toy set for boys of age 3 years and above. The Car carrier truck is 21 inches in size and it is uniquely design to keep all the cars and accessories within it. The accessories include barriers, traffic signs, and barrels. It is the fun car racing toy set, which provides the unlimited fun to little racers. You can get the perfect racing car set from Amazon online shopping in Pakistan. Just hit order now at here and het high quality and imported toys for kids at your doorstep. Prextex Tractor Trailer Car Carrier will Provide Your Little One with Hours of Imaginative Play and Vehicle Fun! Includes: 21" Car Carrier Truck Shaped Carrying Case with Carry Handle and 6 Colorful Mini Cars with Mini Traffic Toy Props. Trailer Case can be detached from Wheels and has Snap-close Lids on Both Sides of the Truck to hold Vehicles. User Comments About Detachable Car Carrier Toy Truck with 6 Toy Cars and Accessories For Kids by Prextex - 21"